Marbald is the mayor of the Land of the Cragnons. 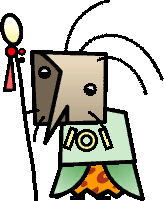 He is a Cragnon himself, and only appears in the game Super Paper Mario. When Mario, Bowser, Princess Peach and the Pixls arrive, he thinks that they have been sent by the Big Rock Who Watches, a spirit or god of sorts who watches over the Land of Cragnons. However, it is possible that this could refer to the player, as the game periodically references the player as some sort of otherworldly being. Marbald asks the heroes to help him defeat the Floro Sapiens and King Croacus IV, who are attacking the Land of Cragnons, which they agree to do. After the chaper is completed, he plays no other important role in the game.